A NOLS Wilderness Medicine Institute Wilderness First Aid (WFA) class was offered at the Tucson REI, which fit nicely into my plan of visiting my parents before heading east in April. Another Class of 2016 hiker has already reported on many of the first aid scenarios I encountered at the NOLS course (except that I also had the unfortunate luck of being hit in the head with a poorly thrown rock while attempting to hang my food bag.) It was well-worth attending, however I’m not sure how useful I’d ultimately be if I was truly the first person on the scene of an accident or illness. We covered almost 20 different medical emergencies over two days. There are so many things to remember. I almost always forgot to check the patient’s airway first, even though that is the “A” in the ABC (+ DE) of surveying the patient for immediate life threats. 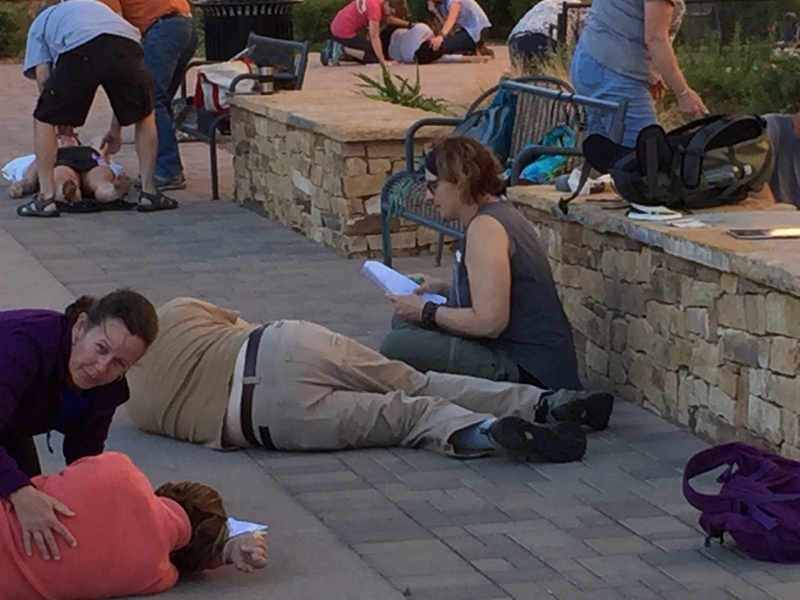 I just hope that if anything happens to me, a WFA-trained hiker recalls the correct protocols much better than I.
Assessing patients after an unusual whitewater rafting mishap, fortuitously located right by the front door of Tucson’s urban REI. 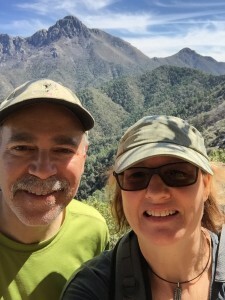 One of the hikes my husband and I were able to get in during our short visit was an eight-mile jaunt in the Santa Rita Mountains, part of the Coronado National Forest and Wilderness Area. Being the one in training, there was no paper-scissors-rock challenge determining who got to carry the daypack on this outing. Although half the weight of my full AT backpack, it still contained three liters of water, our lunch, and some extra clothes and emergency items. I sported my now familiar Appalachian Trail uniform consisting of a wool shirt, Purple Rain™ hiking skirt and Icebreaker® zone shorts while hiking in Merrill Moab hiking shoes with added SuperFeet insoles. The new Dirty Girl gaiters made their debut. And passed. Our hike began at an elevation of 5450′ from the Mt. Wrightson picnic area and trailhead at the end of Madera Canyon (which incidentally is a rock star status migratory birding area). After the initial .3 mile approach trail, we switch-backed straight up 1.5 miles toward Josephine’s Saddle, a gain of more than 1600′ to 7080′. I got winded. When we reached the elevation and checked the time, we realized it had taken more than 2 hours. I was shocked. Luckily, I had just learned about how to treat shock the day before, so I quickly recovered. Fully recovered from the shock of taking more than two hours to hike up to the Agua Caliente connecting trail. Mt. Wrightson watches over us in the background. We summited that bad boy back in 2012. Once we reached the ridgeline, the remaining 6.2 miles of trail, including the 3.7-mile descent, gave us no problems. We were back to the car three hours later. Overall, I was satisfied with the excursion—especially knowing that the highest point on the AT is 6,655′ Clingmans Dome in Great Smoky Mountain National Park. Plus, the Santa Rita Mountains are pretty sweet in spring when you’re from Wisconsin. The trail meanders along canyons, over ridges and among trees. And feeling summer-like sunshine again wasn’t altogether unpleasant either. In Spring 2012, we had hiked and summited Mt. Wrightson, another 2.2 miles and 2000 feet up from Josephine’s Saddle—and above tree line—at an elevation of 9,453′. My mother also summited this peak, back in 2000. When she was 62. Mom does lots of walking, but doesn’t really backpack, so this was quite the feat. 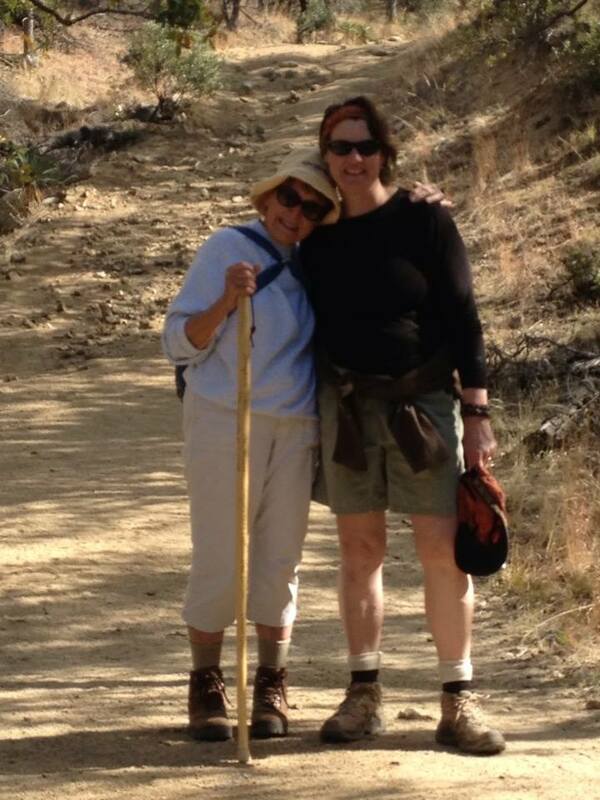 My mom and I after a hike in Madera Canyon in 2014. Arizona is full of trails threading through national forests and mountain ranges where there are peaks to bag, rivers to cross and deserts full of sagebrush and cacti to explore. The longest trail, the Arizona National Scenic Trail (AZT), extends 800 miles from Mexico to Utah traversing biomes ranging from desert to boreal forest. I am writing this post on the flight back to Wisconsin, where the temperature is purportedly 28 degrees, the exact inverse of the 82 degrees we just left in Arizona. Although I can’t see myself hankering to hike the Pict-less, arid and often shadeless long-distance trails in Arizona, it was a great late-winter state to hit before hitting Appalachia. Only those of you of a certain age will appreciate this reference from Ummagumma. A Pict, in this situation, refers to a member of an ancient people of uncertain origin who inhabited parts of northern Britain, fought against the Romans and in the nineteenth century A.D., united with the Scots. And yes, this reference still makes no sense.